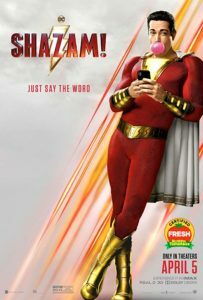 The hero of Shazam! is a simpering prat; the villain has none of the seductive qualities of the great antagonists. The family that director David Sandberg puts together is real enough to give one of the final twists of the movie some actual emotional punch. The Substandard on Aquaman and Shazam! In this latest micro episode, the Substandard breaks apart the trailers for Aquaman and Shazam! Everyone agrees Aquaman will be an unmitigated disaster. Sonny is betting Shazam! does great numbers. JVL strongly disagrees. Vic liked the version of Shazam! starring Shaquille O’Neal. The Substandard is sponsored by The Black Tux, the easy way for guys to rent suits and tuxedos online. Suits usually retail for $1,200, start at just $95 at The Black Tux! To get $20 off your first purchase, visit TheBlackTux.com/substandard. The Black Tux. Premium rental suits & tuxedos, delivered. Join the conversation and comment on this podcast episode: https://ricochet.com/podcast/sub-beacon/shazam-and-the-criterion-channel/. Naturally there's a Woke Moment. Shazam rushes to save a woman from a mugging but she's already saved herself because she doesn’t need his toxic masculinity because women are mighty n' stuff. Billy Batson is an insecure, 14-year-old teen living in a foster care system he hates. He has no plans of staying – as he’s proven countless times by running away. “I can take care of myself,” he tells a social worker. But that can’t happen until he’s 18. The post Silly ‘Shazam’ (Mostly) Charms Our Inner Child appeared first on Hollywood in Toto. America has two Captain Marvels. One debuted last month but the original is hitting screens now, and 'Shazam' is a better movie. by steel stool sample on Shazam! The three main characters were white. (Or maybe (((white))) but they passed anyways.) So that was a change. But because of that, they have to cram as much """diversity""" in as possible where they can. So every single side character or extra is a strong, powerful, independent black woman or whatever. Pretty gay. But the setting of a foster home makes the diversity thing kinda' fit so I didn't mind it as much. Lots of empowered Asian men for their Chinese audience. And a manlet Asian man with a white girlfriend one or two times in the background, to appease the hapas reddit forum. (AMWF) lol...Also there was only 1 scene where they brought extra attention to it. (Some feminist women saying she didn't need to be saved.) And the guy even made a self aware joke about it talking about "getting woke. "Instead of praying properly and holding hands, (which was a crucial theme of the movie), they instead watered it down for a more global audience and just had them say "all hands on deck." Like a football team about to do a cheer before a game. Pretty gay. But the implied Christian / moral elements were nice for a change. Afterall, the bad guys are literally avatars of the seven deadly sins. So it's a reoccurring theme throughout. There's some gruesome moments and bad language, so maybe only take your preteens and up. But it should be good for a family outing. So I guess it's anti-god a little bit by not being overt, but actually Christians will most likely enjoy the film.As far as the "neo-marxism" ratings. They just have a lot of bullsh*t equality themes as usual. Sharing. Redistributing the wealth. You know, the usual. Nothing too nuts.One thing I really liked was how they showed what happens when you tell a child they're evil and will never be good enough. (Spoiler, he turns into a bad guy.) To me, it is exactly what's happening with our anti-white society. They're pushing white hetero kids too far and creating skinheads.Go see the film. Pay to see it if you want. Don't expect much, it's just a slapstick kinda movie with silly banter throughout. (My gf said she wished there was more character development with all the supporting cast, and that she didn't feel much with the main character's past.) So imagine an Adam Sandler movie and you'll be good.